One of the more desirable properties of an effective gasket in industrial applications for compressed fiber gasket material is the ability to withstand high compressive loads. Most industrial gasket applications involve bolts exerting compression well into the 14 MPa (2000 psi) range or higher. Generally speaking, there are several truisms that allow for best gasket performance. One of the more tried and tested is: "The more compressive load exerted on the gasket, the longer it will last". 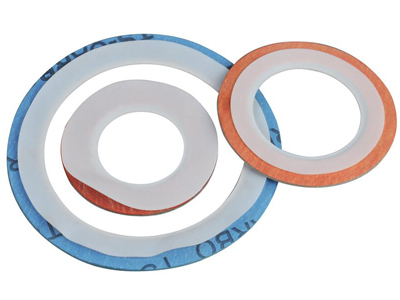 Spiral-wound gaskets comprise a mix of metallic and filler material. Generally, the gasket has a metal (normally carbon rich or stainless steel) wound outwards in a circular spiral (other shapes are possible) with the filler material (generally a flexible graphite) wound in the same manner but starting from the opposing side. This results in alternating layers of filler and metal. The filler material in these gaskets acts as the sealing element, with the metal providing structural support. The constant seating stress gasket consists of two components; a solid carrier ring of a suitable material, such as stainless steel, and two sealing elements of some compressible material installed within two opposing channels, one channel on either side of the carrier ring. The sealing elements are typically made from a material (expanded graphite, expanded polytetraflouroethylene (PTFE), vermiculite, etc.) suitable to the process fluid and application. Constant seating stress gaskets derive their name from the fact that the carrier ring profile takes flange rotation (deflection under bolt preload) into consideration. With all other conventional gaskets, as the flange fasteners are tightened, the flange deflects radially under load, resulting in the greatest gasket compression, and highest gasket stress, at the outer gasket edge. (iii) the sufficient gasket seating stress is achieved on installation necessary to affect a seal, then the possibility of the gasket leaking in-service is greatly reduced or eliminated altogether. Double-jacketed gaskets are another combination of filler material and metallic materials. In this application, a tube with ends that resemble a "C" is made of the metal with an additional piece made to fit inside of the "C" making the tube thickest at the meeting points. The filler is pumped between the shell and piece. When in use the compressed gasket has a larger amount of metal at the two tips where contact is made (due to the shell/piece interaction) and these two places bear the burden of sealing the process. Since all that is needed is a shell and piece, these gaskets can be made from almost any material that can be made into a sheet and a filler can then be inserted. This is an effective option for most applications. Kammprofile gaskets are used in many older seals since they have both a flexible nature and reliable performance. Kammprofiles work by having a solid corrugated core with a flexible covering layer. This arrangement allows for very high compression and an extremely tight seal along the ridges of the gasket. Since generally the graphite will fail instead of the metal core, Kammprofile can be repaired during later inactivity. Kammprofile has a high capital cost for most applications but this is countered by long life and increased reliability. A flange gasket is a type of gasket made to fit between two sections of pipe that are flared to provide higher surface area. Flange gaskets come in a variety of sizes and are categorized by their inside diameter and their outside diameter. Sheet gaskets are simple, they are cut to size either with bolt holes or without holes for standard sizes with various thickness and material suitable to media and temperature pressure of pipeline. 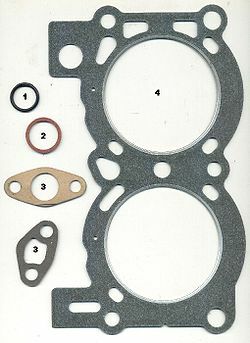 Ring gaskets also known as RTJ. They are mostly used in offshore oil- and gas pipelines and are designed to work under extremely high pressure. They are solid rings of metal in different cross sections like oval, round, octagonal etc. Sometimes they come with hole in center for pressure . 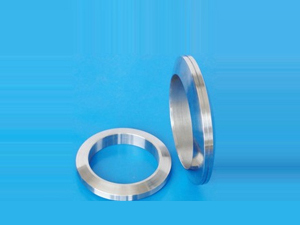 Spiral wound gaskets are also used in high pressure pipelines and are made with stainless steel outer and inner rings and a center filled with spirally wound stainless steel tape wound together with graphite and PTFE, formed in V shape. Internal pressure acts upon the faces of the V, forcing the gasket to seal against the flange faces.